Founded in 1805, University Hospital Tübingen is a large teaching hospital in central Baden-Württemberg, Germany. The hospital’s Comprehensive Cancer Clinic (CCC) Tübingen-Stuttgart is a center of excellence in the National Program of Interdisciplinary Oncology and the Department of Radiation Oncology is one of the leading treatment centers for radiation therapy in Germany, treating around 2,500 new patients every year. 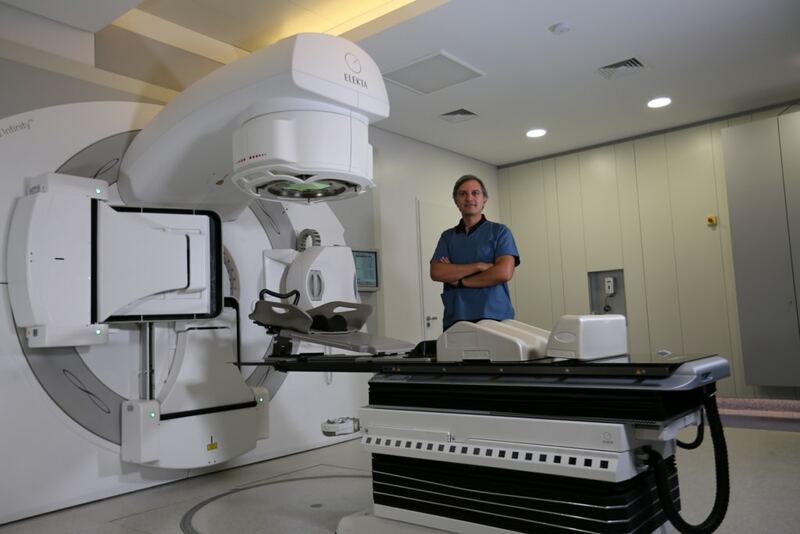 The department treats all radiation therapy indications, using a comprehensive range of advanced techniques, and has an extensive research program, with around 10% of patients involved in clinical trials. 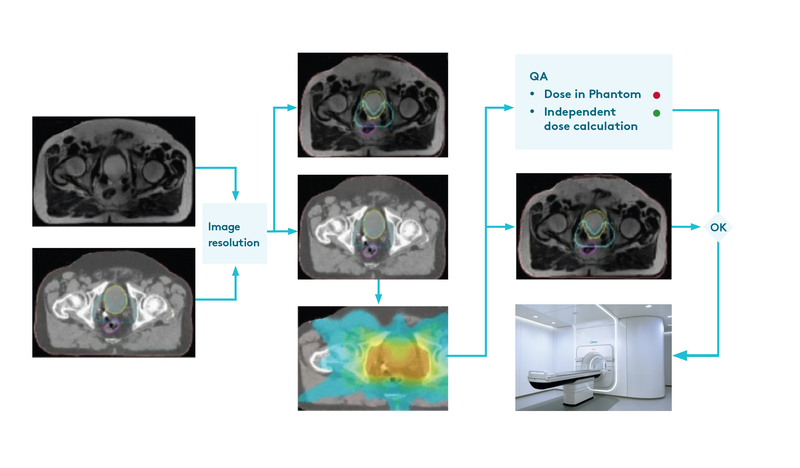 The Department of Radiation Oncology at Tübingen has specific expertise in image guided radiation therapy (IGRT) and special research interest in the biological response-based individualization of treatments using imaging biomarkers. Following preparation of an existing bunker, the installation of the MR-linac began with the delivery of the magnet in September 2017. In June 2018 (when Elekta Unity received CE marking), the first patients at Tübingen were imaged on Elekta Unity. On-site staff training took place in August and September 2018. 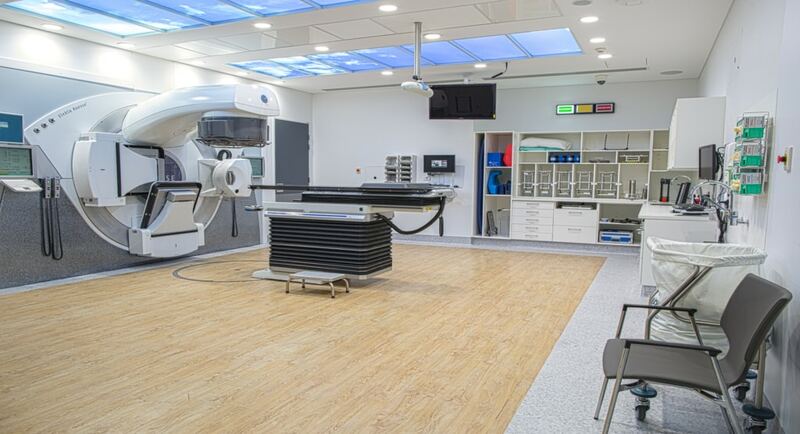 In addition, key members of the clinical and physics teams visited Elekta Unity installations at the Netherlands Cancer Institute-Antoni van Leeuwenhoek Hospital (NKI-AVL) and the University Medical Center (UMC) Utrecht in the Netherlands. The core team for Elekta Unity at Tübingen currently consists of four radiation oncologists, four physicists and four RTTs in order to provide vacation cover and a constant clinical service. Further training will gradually roll out expertise further throughout the department. Commissioning of Elekta Unity took place in September 2018 and the first patient was treated on the 20 September 2018. 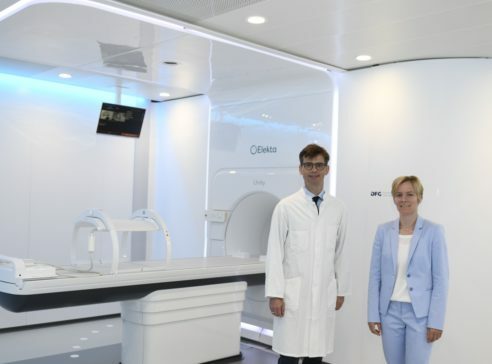 Patients to be treated on Elekta Unity as part of the feasibility study at Tübingen are selected on clinical grounds, where online MR imaging and plan adaptation offer advantages in individual cases, and they must be eligible for MR imaging. The capabilities of the system and the details of their treatment are explained and their consent to be part of a study is obtained. A pretreatment planning CT scan is acquired using the same indexed table top and MR-compatible accessories that are used with Elekta Unity. The MR-linac team is present for this as they are familiar with the indexing, positioning devices and documentation required. The team then takes the patient for MR simulation imaging. Delineation is performed using CT and MR data and a reference treatment plan is created using Monaco (figure 1). 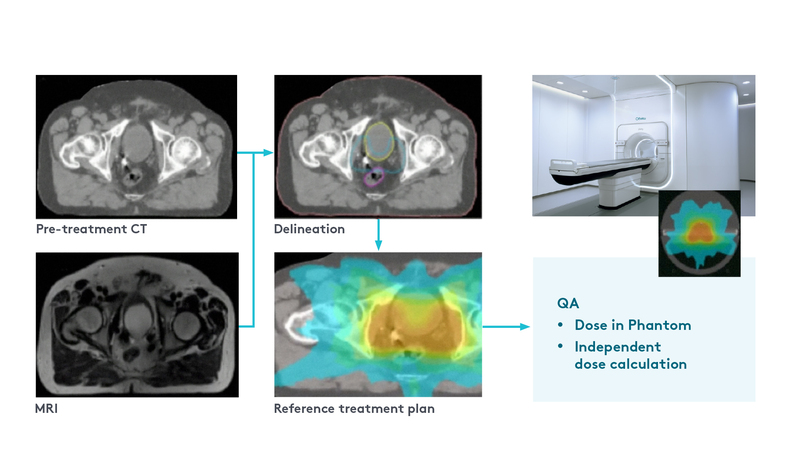 Pretreatment quality assurance is performed by delivering this reference plan to a phantom prior to the first fraction and measuring the delivered dose distribution. The reference plan is also checked using in-house independent dose calculation software. Before each fraction, an MR check is performed before the patient enters the Elekta Unity treatment room. They are then positioned on the treatment table before a daily 3D MR image is acquired and automatically registered to the reference image. The contours are checked and the plan is adapted according to any visible changes while the patient remains on the treatment table (figure 2). 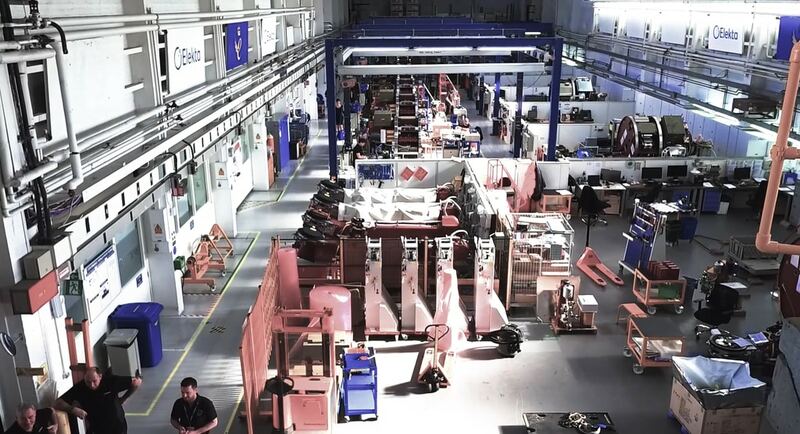 Elekta Unity supports two online adaptive workflows. In ‘adapt to position’, the reference dose is shifted to the daily target position. This is an efficient workflow in terms of time and expertise required in the online environment. In the ‘adapt to shape’ workflow, the dose is adjusted to conform to the daily deformed anatomical structures. As the patient is on the treatment table, the adapted plan is checked automatically using the department’s independent dose calculation software. Then, the dose is delivered to the patient. During treatment delivery, simultaneous motion monitoring is performed using live 2D MR images acquired in up to three planes. Dose delivery can be paused if target position exceeds preset limits. Providing the patient is comfortable, a post treatment 3D MR image is acquired before they get down from the treatment table. Post treatment quality assurance is performed after each treatment to check agreement between the calculated and measured dose. Currently, four staff members are present for each Elekta Unity treatment. A radiation oncologist and a medical physicist, both familiar with the treatment plan, and two RTTs – one managing the MR and patient communication, and the other managing the treatment control system. This may change in the future as the team gains experience. From the MR check until the patient leaves the Elekta Unity treatment room, 30-40 minutes are required for the ‘adapt to position’ workflow, at present. This currently allows up to five patients to be treated on Elekta Unity per day at Tübingen, with a half-day dedicated to treatment delivery. It is hoped that this number will increase to around 10 patients per day by early 2019.